India’s first mid size single extruder 3D printer with a unique gantry design for easy 3D printing of mid size prototypes. 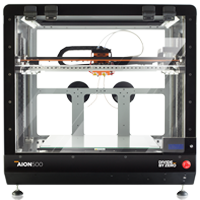 Aeqon 400’s low-noise operation, quick-load functionality, super-fast slicer and industrial-grade build quality ensure reliable print-cycles. With specially design high precision ball screws gantry along with print speed upto 200mm/sec, this 3D printer delivers unmatched precision and repeatability - a prerequisite in rapid prototyping and low-volume batch manufacturing. Superior features like USB and Wi-Fi allow seamless connectivity and the built-in camera allows remote monitoring of print batches. 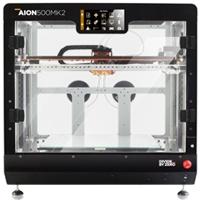 With a unique build volume and an easy-to-use interface, the Aeqon 400V3 is an ideal prototyping machine for product development applications. Machine that grows with you. We call it "Start Small, Think Big" technology. 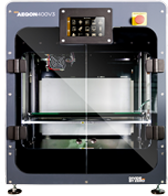 One machine or multiple machines, all AEQON 400V3 machines can be connected through WI-Fi, Ethernet and USB and can be accessed through web browseron your desktop with access to live camera feed of the print and queue your next prints for your operator who has limited machine access if you want it. Our advanced extruder design ensures minimum heat creep in the mechanism thanks to our unibody machined extruder that enables you to print with 2x deposition rates. Active filament sensor provides alert upon material flow interruption filament consumption, thus saving valuable time and material, ensuring uniform flow during part build. Save upto 35% space with unique design that lets you enjoy similar build platform with huge saving on machine foot prints. Our development team has come up with unique dual pre - loaded ball screw mechanism in Z axis to ensure vibration free high precision, high speed operation of the machine. It achieves 25% to 40% better speed without compromising on quality contrary to traditional cantilever gantry mechanism. Print materials like carbon fibre, ABS, Polycarbonate, Polyurethane on the same machine. Thanks to our advanced extruder mechanism design that can handle various abrasive materials, variable flow and temperature. You can print flexible, high strength, temperature resistant materials in the same machine with almost zero setup time. This feature improves the quality of printing and component bed adhesion by taking several measurements of the build platform surface and then adjusting all movement to follow the tilt or contours of the bed & along with unique ability to compensate for all the build surface height irregularities. ABS+, PLA, Metal fill, Carbon fibre, Polycarbonate, Polyurethane, ABS - PC.